If there’s any grain of good news here, especially for those living in Hawaii, it’s that the linguistics actually comes in before the dreams. Thus, there is a very remote chance that these dreams are actually day residue from the dreambot runs. The bad news is that the significant overlap in the dreams and the timing thereof does not bode well for the day residue theory here. In order to rule out Emerald, I did a google search to see if there are any significant Emeralds in Hawaii, and there is: Wailea Emerald Golf Course. For their jingle, they call it “A Tropical Playground,” and their website is here: http://www.waileagolf.com/wailea-emerald-maui-golf-course/ (this will be important later for our location discussion). As far as “rocket” goes in the lingo, there is a 90+% chance that this is day residue from the SpaceShip meme. Specifically, no one dreamed about rockets before the Antares rocket blew up last week…instead they dreamed about Spaceships. After the fact, once most of the news agencies called Antares a “rocket,” all the dreamers suddenly dreamed about that word instead. The point is: I’m fairly sure that rocket does not belong in that first lingo, which is why it’s in brackets. This phrase will come into play when we talk about the timing and the location estimates. We’ll talk about timing later, but I pulled up a weather forecast, and nothing storm-related seems to be approaching Hawaii in the near term. Therefore, if this whole warning plays out with a typhoon or hurricane, it won’t be for a couple of weeks, according to the weather report. However, big waves can certainly be caused by other phenomena, of which we have very little support and/or indication in the dream material. Examples include a huge bomb, volcano, possibly earthquake, big meteor, and even HAARP. Bottom line, the wave meme does look prominent, but a causation for the wave is nil. Additionally, as advisor “Alex” has offered to us, “Huge Wave” could easily be an energy wave of some sort. Wave does not necessarily imply water, but Trapper’s dream does suggest a LOT of water. Basically, this whole WHAT portion of our warning is severely lacking in detail. 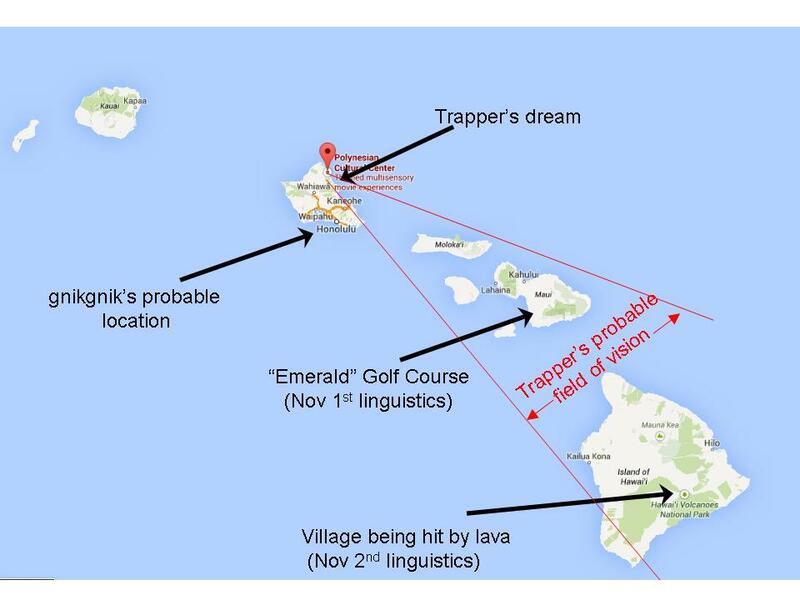 Okay, when you read Trapper’s dream, you’ll notice that he’s hovering near the Polynesian Cultural Center, looking “towards Kaneohe and Kailua,” which means his focal point is probably mostly oriented on Kaneohe/Kailua, but most of Hawaii’s other islands are within his field of view (see red cone area in map). Interestingly, gniknkik’s dream probably takes place on the same main island, being that the dreamer emphasized masses of people being stuck at an airport. So how about this…the linguistics actually brings in two other islands, as strange as that is to me. First, the only Hawaiian “emerald” I could find is on Maui, and the Red-Flagged “village” that we found on that Nov 2nd linguistics run on the biggest island. All of those mentioned are within Trapper’s probable field of view (regardless if he was consciously trying to see that far out). The point here: for the WHERE component if something does happen to Hawaii, it appears that most of the islands will be affected. This is another big unknown. We have lots of different markers that could help us here. First off, most dreams come true within one week, and they are also the most accurate if they do come true within a week. However, that only applies to non-incubated dreams, of which we only have Trapper’s Nov 3rd dream. Therefore, the 1st time marker is 7 days from his dream which is Nov 10, 2014. The second one was a Project Año dream, and when the year 2015 is incubated, that automatically moves the expected timeline toward 2015 in a bell-shaped pattern, where the highest probability of it coming true will be inside 2015, except there are indeed lower probabilities of it happening just outside 2015. Next, the location linguistics seems to favor 6 weeks, because for some reason, specific locations that show up in linguistics, for some reason come true in about 6 weeks (such as in the famous Dallas meme). Granted, this Hawaii linguistics was nowhere near as impressive as the Dallas meme, which could mean several things. The longer this takes to manifest, the bigger the event. However, the second linguistics has perhaps some of the best time indicators that the NDC has ever known….celestial events. In that Nov 2nd run, the word Moon shows up actually twice (Moon and Moons), which very rare. I see this is a pretty specific time marker…the event will be on the 2nd of two moons. Now, the only problem is the phase of the moon. If we choose the 2nd “new moon,” we would bypass Nov 22nd’s new moon and look towards Dec 22, 2014 as the date here. Hmmmm….the winter solstice. But huge waves I think might be better matched for full moons, and that would present much earlier, because the 2nd full moon from Nov 2nd bot run is actually Dec 6, 2014. In my opinion, the most likely dates here for a Hawaii event should look like a big bell curve of probabilities. The highest probability for timeframes will be between Nov 6th and Dec 6th. If we make it through this period without “an event,” then the probability diminishes, although it still can certainly happen outside those dates. If someone wants a specific date, I would suggest that very top of the probability curve is December 6th, 2014. Most would want to know the probability of all this actually coming true. Answer: With the type of overlap we see here, we are actually right in the heart of very highest rung of probabilities. Based on our statistics, we’re looking at roughly 92% chance of something like this occurring in the area of Hawaii during the broader time frame. To narrow into our triangulated timeframe of Nov 6 – Dec 6, 2014, the likelihood reduces to about 75-80 percent. This last percentage is a little rougher because of the small sample size of that situation. Either way, the indicators here look troubling and we are concerned for Hawaiians. This note is very important as well. I actually moved the thread above out of the DremForecaster’s private forum into public view just now, so there is no way that this material could have been accessed by Trapper or gnikgnik. By Eagle1|2014-11-04T22:02:54+00:00November 4th, 2014|Project Año, Reports / Predictions|Comments Off on Yellow Caution: All Eyes on Hawaii!